WizKids has announced the release of the new D&D Icons of the Realms: Waterdeep: Dungeon of the Mad Mage .. what a mouthful to say, but a lot of minis included in the set! In the city of Waterdeep rests a tavern called the Yawning Portal, named after the gaping pit in its common room. At the bottom of this crumbling shaft is a labyrinthine dungeon known as Undermountain, domain of the mad wizard Halaster Blackcloak who has seeded his lair with monsters, traps, and mysteries. This set of collectible figures perfectly represents many of the monsters and villains found throughout the 23 levels of Undermountain detailed in Waterdeep: Dungeon of the Mad Mage. Collect all 44 figures from Waterdeep: Dungeon of the Mad Mage, the newest set of randomly sorted monsters and heroes in our exciting line of D&D miniatures, Icons of the Realms. Wizkids has released the D&D Icons of the Realms: Monster Menagerie series of pre-painted miniatures to North American retail. In Monster Menagerie you will find a vast array of challenges for your heroes to overcome and allies to fight by your side. Face Bulettes as they use their powerful claws to tunnel through the earth when they hunt. Or the Gelatinous Cube as it scours dungeon passages in silent, predictable patterns, leaving perfectly clean paths in its wake. Or the Displacer Beast which takes its name from its ability to mask itself with illusion, displacing light so that it appears to be somewhere it is not. WizKids announced that the inaugural wave of D&D Icons of the Realms miniatures, based on the iconic Dungeons & Dragons roleplaying game from Wizards of the Coast is available in select stores now! Inspired by the new Tyranny of Dragons storyline, players can expect to find dragons, kobold fighters, bugbears, wraiths, mind flayers, and many more iconic Dungeons & Dragons characters guaranteed to level up their tabletop RPG experience. 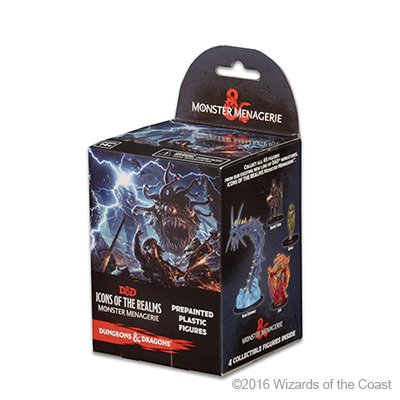 Collect all 44 miniatures found in the D&D Icons of the Realms: Tyranny of Dragons booster packs today! Just getting started with your collection? Wizkids recently announced the launch of the D&D Icons of the Realms Starter Set, the perfect supplement to the new Starter Set for the D&D tabletop roleplaying game. The 6-Figure miniatures Starter Set includes the 5 player characters featured in the tabletop roleplaying game Starter Set and are some of the most iconic classes and races from the Dungeons & Dragons universe, including the dwarf cleric, human ranger, Halfling rogue, Northlands fighter, elf wizard, and the famous drow ranger, Drizzt Do’Urden. This Icons of the Realms Starter Set is the perfect supplement to the brand new Starter Set for the Dungeons & Dragons roleplaying game. These figures correspond to the 5 pre generated characters found in the Starter Set and are also some of the most iconic characters classes and races from the Dungeons & Dragons universe, including the dwarf cleric, human ranger, Halfling rogue, Northlands fighter, and elf wizard. As an added bonus this set also includes the famous drow ranger, Drizzt Do’Urden.